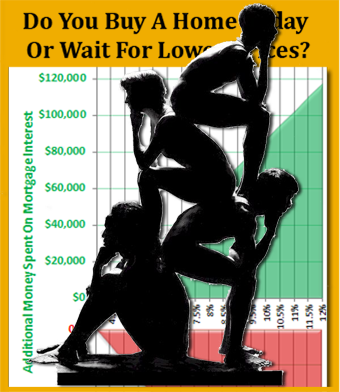 How To Decide Whether To Buy A Home Or Wait? A question on many people's minds these days is whether you buy a home or wait until home values fall even further. We know that home values will continue to decline over the next several years. And we also expect that these historic interest rates will not last forever. In an attempt to bring clarity to the "buy a home or wait" debate, I have set up a real estate model that will help most people understand that the answer is fairly simple, but it varies for each person's unique situation. In order to create the real estate model on the left, I had to start with some basic assumptions. First of all, I assumed that the average homeowner would be able to borrow money at today's low interest rates. Were this not true, the homebuyer should be more inclined to wait, as home values are still depreciating. Secondly, I assumed that the average homeowner would live in the home for ten years before selling. This allowed me to calculate a total interest expense to use in the comparison. Finally, our model compares the cost of waiting (should interest rates rise) to the cost of not waiting (the real estate depreciation that will occur). The graph shows the amount of "additional money" spent (in green) as interest rates go up. At 4% (today's interest rate), the amount is zero. 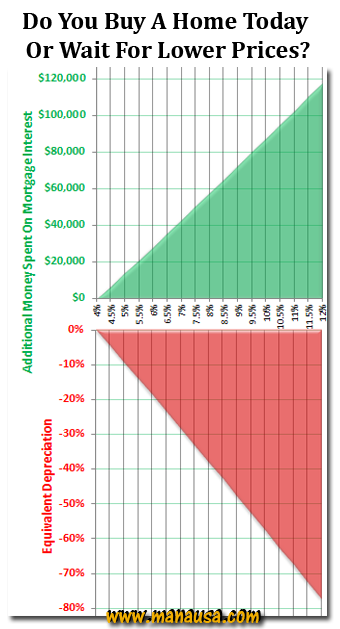 The red portion of the graph shows the equivalent real estate depreciation that would need to occur to equate to the same cash difference that rising interest rates would cost. For example, if you are worried that property values will drop 10% between now and ten years from now, that would equate to a mortgage interest rate increase to 5.1%. Everybody has their own beliefs on what is going to happen to our economy, to mortgage interest rates, and future property values. This model can work for anybody. Simply plug your strongest concern into the model, and compare it with "the other side of the coin." If you are more concerned about rising interest rates, then start on the horizontal axis. Choose a rate you think makes sense, then look straight down and determine the "red" value. That will be the equivalent rate of depreciation needed to be the same as your anticipated mortgage interest rate. I am confident home values will continue to fall. The imbalance between supply and demand will take time to consume, and during that time, pricing pressures will drive values lower. But I am also concerned that mortgage interest rates could rise. When they do, history tells us they will be moving swiftly, and low interest rates will be gone for good. Home values have dropped over 35%, thus the rate of depreciation from this point in should slow. All models that we use show values rising inside of the ten-year span that we have used for the model. Historically low interest rates, coupled with the ability to cherry-pick a below-market value, make the "buy a home or wait" answer lean in the direction of buying now for a family that will live in the home for ten or more years.